Joyce Irene Grenfell, OBE (née Phipps; 10 February 1910 – 30 November 1979) was an English comedian, singer, actress, monologist, scriptwriter and producer. For her film appearances, she was cast in such roles as the gym mistress Miss Gossage in The Happiest Days of Your Life and Ruby Gates in the St Trinian's films. :jacket At that time, it was still unusual for a woman of her high social class to be professionally engaged in show business. The Happiest Days of Your Life is a 1950 British comedy film directed by Frank Launder, based on the play by John Dighton. The two men also wrote the screenplay. It is one of a stable of classic British film comedies produced by Frank Launder and Sidney Gilliat for British Lion Film Corporation. The film was made on location and at Riverside Studios, London. In several respects, including some common casting, it was a precursor of the more anarchic St. Trinian's films of the 1950s. Montpelier Square is a residential garden square located in London's Knightsbridge district, in the City of Westminster, SW7. Charles Paul Phipps (1815–1880), of Chalcot House, Westbury, Wiltshire, was an English merchant in Brazil and later Conservative MP for Westbury (1869–1874) and High Sheriff of Wiltshire (1875). Joyce Phipps had an upper middle class London childhood. Among her friends was Virginia Graham, with whom she kept up a lifelong correspondence. She attended the Francis Holland School in Central London, and the Claremont Fan Court School, in Esher, Surrey. She attended Mlle Ozanne's finishing school in Paris at the age of seventeen. Virginia Margaret Graham (1910–1993) was a London-born English writer, critic and poet, whose humorous verses on Second World War subjects were republished in London by Persephone Books in 2000 as Consider the Years 1938–1946. She had a long correspondence with Joyce Grenfell, which was later published. Francis Holland School is the name of two separate independent day schools for girls in central London, England, governed by the Francis Holland Schools Trust. The schools are located at Clarence Gate and at Graham Terrace. Central London is the innermost part of London, in the United Kingdom, spanning several boroughs. 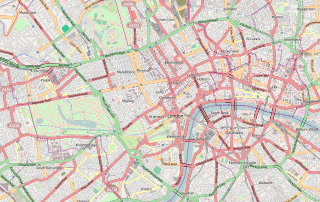 Over time, a number of definitions have been used to define the scope of central London for statistics, urban planning and local government. Its characteristics are understood to include a high density built environment, high land values, an elevated daytime population and a concentration of regionally, nationally and internationally significant organisations and facilities. The King's Royal Rifle Corps was an infantry rifle regiment of the British Army that was originally raised in British North America as the Royal American Regiment during the phase of the Seven Years' War in North America known as 'The French and Indian War.' Subsequently numbered the 60th Regiment of Foot, the regiment served for more than 200 years throughout the British Empire. In 1958, the regiment joined the Oxfordshire and Buckinghamshire Light Infantry and the Rifle Brigade in the Green Jackets Brigade and in 1966 the three regiments were formally amalgamated to become the Royal Green Jackets. The KRRC became the 2nd Battalion Royal Green Jackets. On the disbandment of 1/RGJ in 1992, the RGJ's KRRC battalion was redesignated as 1/RGJ, eventually becoming 2/RIFLES in 2007. She made her stage debut in 1939 in the Little Revue. In 1942 she wrote what became her signature song, "I'm Going to See You Today". Stephen Meredith Potter was a British author best known for his parodies of self-help books, and their film and television derivatives. 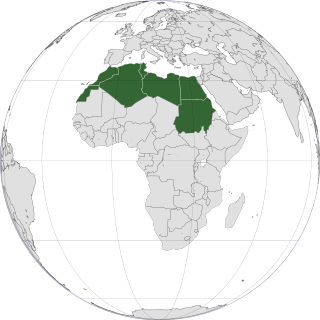 The BBC Third Programme was a national radio service produced and broadcast by the BBC between 1946 and 1967. It first went on the air on 29 September 1946 and quickly became one of the leading cultural and intellectual forces in Britain, playing a crucial role in disseminating the arts. It was the BBC's third national radio network, the other two being the Home Service and the Light Programme, principally devoted to light entertainment and music. The Third Programme was rebranded to BBC Radio 3 on the 30th of September 1967. Grenfell is best remembered for her one-woman shows and monologues, in which she invented roles including a harassed nursery teacher with the catchphrase "George – don't do that". She gained attention as a result of her frequent appearances on the BBC's classical music quiz show, Face the Music . Although her humour appeared light and frilly on the surface, there was often a serious point to be made: the song "Three Brothers", for example, appears to recount the happy, busy life of a spinster in lightweight terms, but it essentially describes her willing slavery to her male siblings and their families. Much of the music for Grenfell’s revues and shows was the result of a collaboration with the composers and pianists Richard Addinsell and William Blezard. From 1954 to 1974, Blezard composed Grenfell's songs and parodic operettas such as Freda and Eric. They performed on stage and television all over Britain, America and Australia. Although her singing career is best remembered for her self penned humorous songs she did also record standards such as Noël Coward songs "If Love Were All" and "The Party's Over Now". Grenfell was taken ill in 1973 with an eye infection, which was subsequently diagnosed as cancer, although she was not told. The eye was removed and replaced with an artificial one. No one except those close to her was ever advised of this. She kept on performing and appearing on the BBC2 programme Face the Music. In October 1979 she became seriously ill and died just over a month later, on 30 November 1979, just before her golden wedding anniversary. She was cremated at Golders Green Crematorium on 4 December and her ashes placed in section 4-D of the Garden of Remembrance. In February 1980, a memorial service was held at Westminster Abbey, the first time such an honour had been granted to a comedian. Only Les Dawson, Ronnie Barker and Ronnie Corbett have been similarly honoured since. 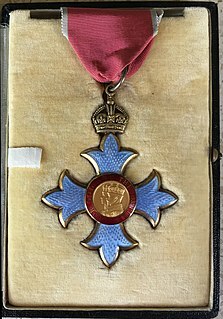 Grenfell was created an Officer of the Order of the British Empire (OBE) in 1946. It was confirmed after her death that she would have been made a Dame Commander (DBE) in the 1980 New Year Honours List. In 1998, the Royal Mail memorialised Grenfell with her image on a postage stamp as part of a series of stamps celebrating Heroes of Comedy. 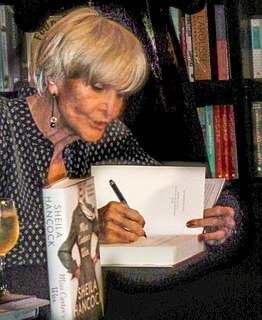 In 2002, her friend and author Janie Hampton published the book Joyce Grenfell. In a 2005 poll to find the Comedians' Comedian, she was voted amongst the top 50 comedy acts ever by fellow comedians and comedy insiders. Maureen Lipman has often toured with the one-woman show Re: Joyce!, which she co-wrote with James Roose-Evans. In it she recreates some of Grenfell's best-known sketches. Lipman also presented the radio programme Choice Grenfell , compiled from Grenfell's writings. Roose-Evans also edited Darling Ma, a 1997 collection of Grenfell's letters to her mother. Grenfell, Joyce (1976). Joyce Grenfell Requests the Pleasure. London: Macmillan. ISBN 0-333-19428-4. Grenfell, Joyce (1977). George, Don't Do That. London: Macmillan. ISBN 0-333-22080-3. Grenfell, Joyce (1979). In Pleasant Places. London: Macmillan. ISBN 0-333-27288-9. Grenfell, Joyce; Compiled and introduced by Janie Hampton (2000). Hats Off: Poems and drawings. London: John Murray. ISBN 0-7195-6152-3. Victoria Wood, was an English comedian, actress, singer and songwriter, screenwriter, producer and director. Wood wrote and starred in dozens of sketches, plays, musicals, films and sitcoms over several decades, and her live comedy act was interspersed with her own compositions, which she performed on the piano. Much of her humour was grounded in everyday life and included references to quintessentially "British" activities, attitudes and products. She was noted for her skills in observing culture and in satirising social classes. 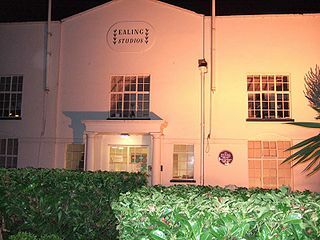 Ealing Studios is a television and film production company and facilities provider at Ealing Green in west London. Will Barker bought the White Lodge on Ealing Green in 1902 as a base for film making, and films have been made on the site ever since. It is the oldest continuously working studio facility for film production in the world, and the current stages were opened for the use of sound in 1931. 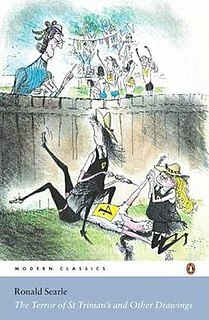 St Trinian's was a British gag cartoon comic strip series, created and drawn by Ronald Searle from 1946 until 1952. The cartoons all centre on a boarding school for girls, where the teachers are sadists and the girls are juvenile delinquents. The series was Searle's most famous work and inspired a popular series of comedy films. Hermione Youlanda Ruby Clinton-Baddeley was an English actress and voice actress. She typically played brash, vulgar characters, often referred to as "brassy" or "blowsy". She found her milieu in revue, in which she played from the 1930s to the 1950s, co-starring several times with Hermione Gingold. She was best known for her roles as Ellen the maid in Mary Poppins, Mrs. Naugatuck in the TV series Maude, Madame Adelaide Bonfamille in The Aristocats, and Auntie Shrew in The Secret of NIMH. The Pure Hell of St Trinian's is a 1960 British comedy film set in the fictional St Trinian's School. Directed by Frank Launder and written by him and Sidney Gilliat, it was the third in a series of four films. 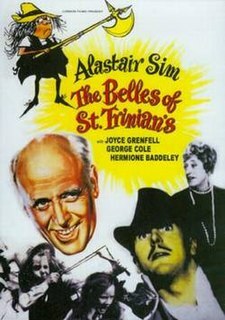 The Belles of St Trinian's is a British comedy film set in the fictional St Trinian's school, released in 1954. It and its sequels were inspired by British cartoonist Ronald Searle. Directed by Frank Launder and written by Launder and Sidney Gilliat, it was the first of a series of four films. Dora May Broadbent,, known as Dora Bryan, was an English actress of stage, film and television. Rosalind Knight is an English actress. Her career has spanned over 60 years on stage, screen, and television. Her film appearances include Blue Murder at St Trinian's (1957), Carry On Nurse (1959), Carry On Teacher (1959), Tom Jones (1963), and About a Boy (2002). She played Beryl in the BBC sitcom Gimme Gimme Gimme (1999–2001). Choice Grenfell was a short-lived radio programme that aired in March 1998. There were five twenty-minute episodes and it was broadcast on BBC Radio 3. It starred Maureen Lipman. The series was also recorded as an audio cassette by the BBC Radio Collection. Zawedde "Zawe" Ashton is an English actress, playwright and director best known for her roles in Channel 4 comedy dramas Not Safe for Work and Fresh Meat. Other credits include the feature films Blitz and St Trinian's 2: The Legend of Fritton's Gold. Colonel Chiswell Dabney Langhorne was an American railroad industrialist. He was the father of Nancy Witcher Langhorne and the maternal grandfather of both Joyce Grenfell and Michael Langhorne Astor. Herbert Farjeon was a major figure in the British theatre from 1910 until his death. He was a presenter of revues in London's West End, a theatre critic, lyricist, librettist, playwright, theatre manager and researcher. William Blezard was a talented pianist and composer who was musical director to Noël Coward, Marlene Dietrich and Joyce Grenfell. Sara Patricia Pascoe is an English comedian and actress. She has appeared on TV programmes such as 8 Out of 10 Cats Does Countdown for Channel 4, and Taskmaster for digital channel Dave. Janie Hampton is a British author, best known for her biography of Joyce Grenfell and social history books The Austerity Olympics, How the Girl Guides Won the War, and an international development and women’s health activist. ↑ Grenfell, Joyce (1976). Joyce Grenfell requests the pleasure (autobiography). Macmillan. p. 13. ↑ A Genealogical and Heraldic History of the Commoners of Great Britain and Ireland, vol. IV, 1838, pp. 509–510, "Phipps of Leighton House" pedigree. ↑ Joyce & Ginnie: the letters of Joyce Grenfell and Virginia Graham, edited by Janie Hampton, 1997. ↑ Victoria Crosses on the Western Front August 1914–April 1915: Mons to Hill 60, Peter Oldfield, Pen and Sword Books Ltd, 2014. ↑ "Choice Grenfell Series 2". Radio Times. BBC. Retrieved 31 May 2014. ↑ "Theatre Collection: search results for Joyce Grenfell". University of Bristol. Archived from the original on 1 October 2012. Retrieved 4 January 2013.